After Roya Hejabian graduated high school in her home country of Iran, she was faced with a life-changing decision. As a Baha’i, she had been discriminated against all her life and now she faced the likelihood of not receiving higher education unless she converted to Islam, the country’s official religion. She chose not to change her faith, and instead decided to apply for ‘refugee’ status with the UN. After receiving help from the UN, she was placed in Turkey for 8 months while she waited to be located to another country. Finally, in September of 1997, she came to live in Maine. Although she had received basic English lessons in Iran and had studied the language during her time in Turkey, her grasp of the language was still very limited. She found it difficult to navigate through a new culture, but despite the troubles, she was happy to have found a new life in Maine. “It’s so peaceful here, I immediately fell in love,” she says. 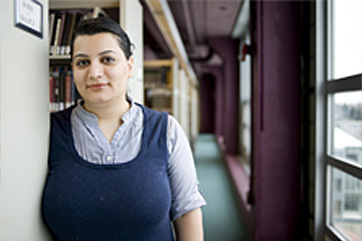 Soon enough, Roya began attending ESL classes at USM, as well as volunteering as a translator for other immigrants from the Middle East. Working mostly through Maine Medical Center, she was able to help others overcome the language barrier that she had also struggled with. “There was this elderly lady that I especially remember,” says Roya as she explains a case where she had to translate for a woman as she went into major surgery. “She told me if she was going to die, at least I’d be there to understand her last wishes. That was the most rewarding case.” Eventually she became self-employed as well as being directly employed by Maine Medical as a translator. Roya continued her work as a translator alongside her education. In the Fall of 2008, she received a scholarship from the Portland English as a Second Language Scholarship Fund, tailored specifically towards medical interpreting. The scholarship allowed her to take a course she could barely afford to buy the book for, and has set her up to begin attending Graduate school in 2009. Today, Roya works mostly at her job with the Community Counciling Center, where she is a Refugee and Immigrant Children’s Case Manager. She also still gets interpreting work on the side as she is still self-employed in that regard. All of the work Roya is doing could not have been done without her understanding the importance of language. © 2018 SMI All rights reserved.